This volume assembles no less than 40 stories set in H.P. Lovecraft's Cthulhu Mythos. 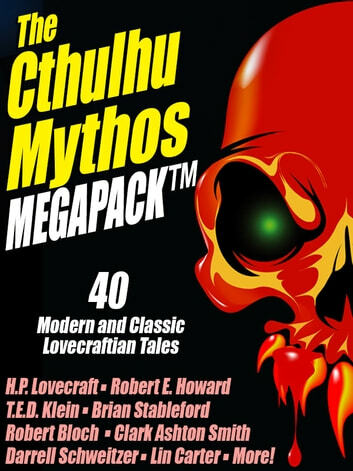 Ranging from Lovecraft's own tales (including classics such as the novel At the Mountains of Madness, "The Shadow Over Innsmouth," and "The Colour Out of Space") to works by his friends and contemporaries (Clark Ashton Smith, Robert E. Howard, Frank Belknap Long, and Robert Bloch), to later followers (Henry Kuttner, Lin Carter, Brian McNaughton), and contemporary afficianados (Brian Stableford, Mark McLaughlin, Adrian Cole) -- and many more. This is one collection no Lovecraft fan can afford to miss! And don't forget to search this ebook store for more entries in the Megapack series -- collections covering Fantasy, Horror, Science Fiction, Mystery, Adventure ... and many more! This is a nice collection of old public domain and some modern work, but marred by sloppy proofing. Something here for all lovers of SF, fantasy and horror with a great selection of authors, past and present. You like Cthulhu? You buy this.